Digital experiences and communicative layers on museum exhibitions. That is the main focus for the Useeum app technology. 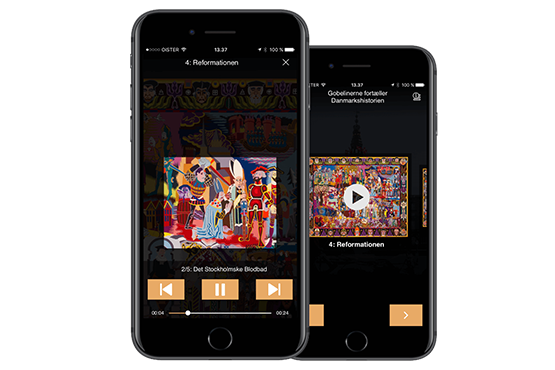 Audioguides and gamification elements are relevant in most museeums globally, however the existing technologies are heavy in installation, budget and maintenance – where the Useeum solution solves those issues, along with being even more userfriendly for the visitors. In our center for Experience Economy & Tourism, Useeum is participating to take the business to the next step and get ready for international customers. “We have had a 360 analysis of our business to meet the challenges and opportunities of future internationalization of the concept”, explains Rasmus Lybæk, Director & Partner in Useeum. Not only the strategies and the business model must be adapted to the international focus, but also establishing the right organization is a key element to success in a scale-up company. See the video below. The potential of guiding and communicating cultural information, directly to the visitor’s mobile phones is heavily underestimated. And combined with a cross-functional storytelling in each institution AND across institutions, it is taking edutainment to the next level. Museums can stand out and differentiate their experience, however they also share a platform with other institutions, which inspires the users to visit all museums in the app – with the benefit of more visitors all in all. “Having professional business experts in the advisory board is a huge advantage, as they have been in the same situation as Useeum faces now, where both ambitions, potentials and challenges are developing. The new thoughts and ideas we get from our customized board is definitely taking us in the right direction,” ends Rasmus Lybæk. “The benefits of our technology are massive, however getting the information out in the international museum environment is the challenge. I though experience great success by establishing my brand as a trusted opinion communicator within the museum business, by writing blogs and adding my opinions and inspiration to the national and global discussions,” explains Rasmus Lybæk, Director & Partner in Useeum.